In Episode #78 on The Jen Mavros Show, joining us for the SECOND time [*YAY*], devotional spiritual teacher & Best Selling Hay House author, the lovely, Rebecca Campbell. During our time together, Rebecca takes us on a journey into "working your light". And when I asked her what working your light means... "Light is your soul, your spirit and to me light is also power. It's not all about rainbows and faeries. I really think that in order to be led by the soul and embody your light, it's not all roses. In order to get to the light, you've got to dive through the shadows." It is time to light up the world with your presence sister. Rebecca's latest offering, a stunning oracle card deck, flooded with cosmic sacred images, where each card acts as a portal, reconnecting you with your soul and your light, she guides us through her deck. There is a field of consciousness where all wisdom resides. A field of consciousness where all of the answers to all of the questions that you could possibly imagine live. Where the wisdom of the heavens and the Earth call you by name. 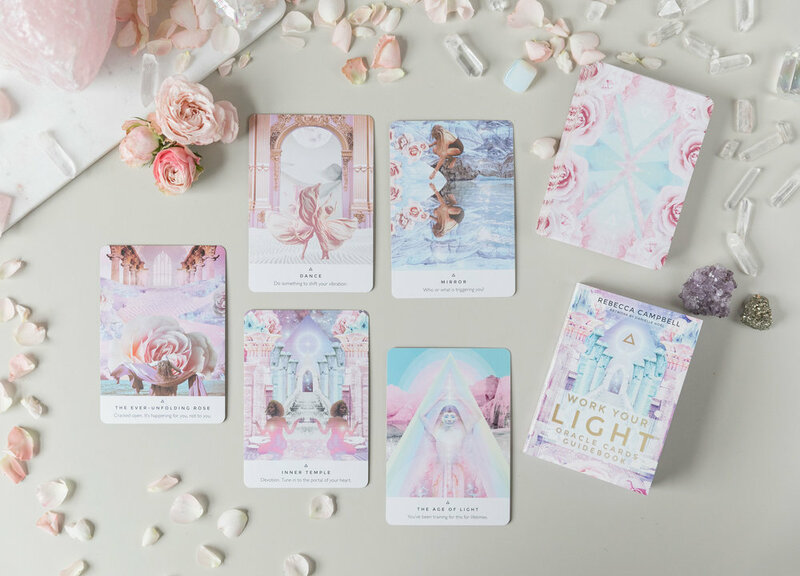 Rebecca's Oracle deck has been created to help you connect with this inner wisdom and to work your light so you can light up the world with your soul’s unique presence. Acknowledgment to illustrator and mystic designer Danielle Noel. Rebecca Campbell is a writer, devotional teacher and the bestselling Hay House author (Light Is The New Black, Rise Sister Rise and the Work Your Light Oracle) and creator of the Rise Sister Rise Sisterhood Membership. Rebecca teaches internationally encouraging people to spend more time with their soul. This is a fun, always soulful conversation that I'm sure you'll love. Rebecca experienced her first awakening as a young teenager and has been studying the intuitive mystic arts ever since. When she was 18 she answered an inner call to go on a solo pilgrimage to initiate herself in the sacred sites of the U.K. and Ireland. She has since traveled many of the world’s ancient sites and leads sacred retreats through her Rise Sister Rise Sisterhood. Through her work, Rebecca guides us to connect to the Inner Temple within. Rebecca’s work is connected to lineages such as Mother God, Avalonian and Magdalene Priestess Paths, Bhakti Yoga and Shamanism. Her work is activating and initiatory. Renowned for feminine leadership, devotion and spiritual service, Rebecca has been awarded ‘Best Emerging Voice’ by Kindred Spirit, ‘Promising New Talent’ by the Mind Body Spirit Festival and ‘Top 100 Women of Spirit’ by the Brahama Kumaris. Some of Rebecca’s qualifications include: Six Sensory Teacher, Bhakti Kirtan Yoga Teacher, Shamanic Energy Medicine Coach and BA Communications. Prior to writing books, Rebecca forged a successful career as an award winning Creative Director in advertising (writer based) where she worked for some of the world’s advertising agencies (such as JWT, TBWA, HAVAS) in London and Sydney to help some of the world’s biggest brands find their authentic voice. In her twenties Rebecca blogged her way around the world as The Skype Nomad and shared her adventures in a regular column in The Daily Telegraph. She also spent a year of her life painting her way around the world with The Let’s Colour Project. Originally from the sunny shores of Sydney, Rebecca now lives in London with her husband and puppy Shakti but you can find her down under most summers getting her salt water and sunshine fix.